Bases in glass fiber reinforced concrete (GFRC) from Stromberg are the correct support you need for the columns on your building. A column without the proper base to support it could cause damage to the existing building. Stromberg knows how to construct columns in GFRC that will properly transmit the weight of a structure above to the structural elements below; and GFRC bases by Stromberg will help transfer the load of the column without undue stress on the foundation of your building. 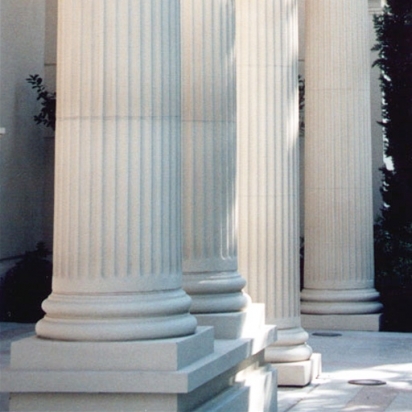 Stromberg manufactures the 5 major types of columns, Tuscan, Doric, Ionic, Corinthian and Composite; and their architectural bases in GFRC will be made to your exact specifications for each type of column. Glass fiber reinforced bases from Stromberg offer you selection, design and versatility. You can choose from their variety of custom designs and finishes too. They offer square and round based, simple and textured and columns and entablature. GFRC makes a very strong base for any column; you’ll be impressed with the artistry of Stromberg bases for your architectural columns. A GFRC base is rugged and made to stand up to the elements, whether placed on the inside or outside of your establishment. With Stromberg’s 30 years of experience and proven techniques, the base they craft for you will last for generations. Glass fiber reinforced concrete has been laboratory tested and shown to stand up to weather conditions like moisture and salt air. The trusted professionals at Stromberg will produce an architectural base that you can be proud of, in a variety of textures, colors and finishes. Stromberg has crafted bases for government buildings, colleges and universities, hospitality locations and churches. In just about any building where columns are a part of the design, glass fiber reinforced concrete bases by Stromberg are there. GFRC bases are available in a variety of textures, colors and finishes. GFRC is made from minerals and is an earth-friendly product. GFRC is rust-resistant and fire-retardant. The artisans at Stromberg Architectural Products will partner with you and see your GFRC base project through to the finish. They have the solution to your architectural needs and will make sure your vision is realized. Stromberg is here to help with CAD details, design assistance and specifications. Contact them today at (903) 454-0904 for your free custom quote, or email them.